The study helps rebalance a euro-centric bent in pinpointing where these stages of our evolution occurred. It also raises the question of how and why one of the characteristics that we consider unique to humans, figurative art, apparently arose not once but twice, at the opposite ends of what was then the inhabited world. In fact, the images, made with red ochre, cannot be dated themselves, explains Maxime Aubert, an archaeologist at Griffith University, in Queensland, Australia. What researchers can do is date the speleothems, the deposits of calcium carbonate left by water dripping along the walls of the cave over thousands of years. In lucky cases, these accretions covered parts of a painting, giving us a minimum age for the image below. 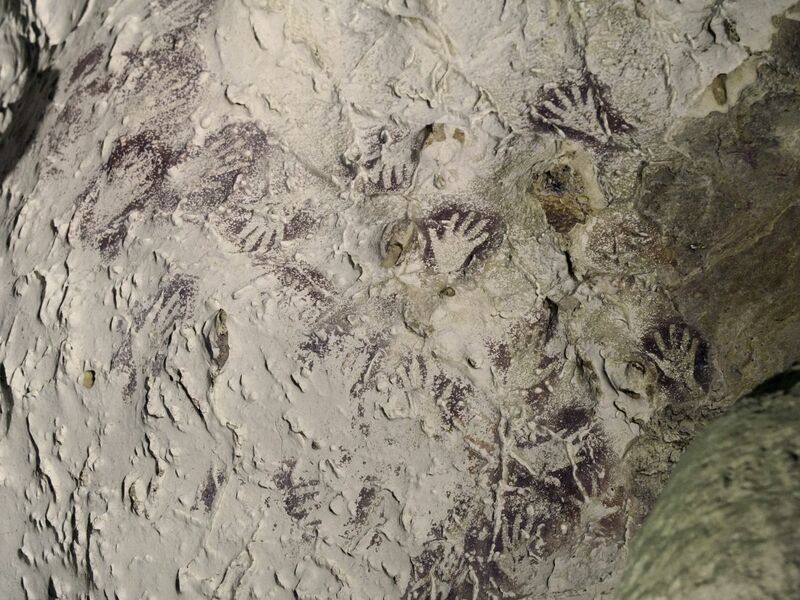 In other cases, prehistoric artists were kind enough to paint over a speleothem, allowing us to glean a maximum age for their work, Aubert says. Samples taken from the Lubang Jeriji Saleh cave showed that an image of an animal, probably a banteng – a species of wild cattle that still lives in Borneo – must have been made before 40,000 years ago. 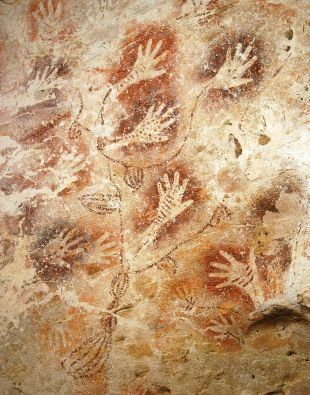 Conversely, a reddish-orange stencil of a human hand had a maximum age of 51,800 years, giving the researchers their date range for the birth of figurative art. The earliest cave paintings found in Europe – the mass scenes of lions, horses and other animals in France’s Chauvet cave – have been dated to around 30,000-33,000 years ago. But there are also the exquisite ivory figurines unearthed in German caves, such as the so-called Venus of Hohle Fels and the Lion Man of Stadel, which date to around 35,000-40,000 years ago, which is the later end of the range for the finds in Borneo. Researchers note that the goal of the new study was not to launch a contest over the oldest examples of identifiable human art. Their main point is that this behavior apparently did not emerge in just one region – Europe – and then slowly spread. “It now seems that two early cave art provinces arose at a similar time in remote corners of Paleolithic Eurasia: one in Europe, and one in Indonesia,” says Adam Brumm, another Griffith University archaeologist who took part in the study. Theoretically it is possible that figurative art arose just once, much earlier than we realize, and then spread to these two areas. But no evidence for that has been found so far. So, what might have been the impetus behind the near simultaneous acquisition of an advanced skill in completely different places, by different peoples? “One possibility is that, initially, both regions were inhabited by small groups and then, because of favorable conditions, the population increased, and with greater numbers comes greater social complexity and the possibility of new forms of expression,” suggests Aubert, the Griffith archaeologist who is the lead researcher on the Nature study. “Another hypothesis would be the arrival of a new population” (that had the skill). The latter idea is certainly a possibility if we consider the rise of the Aurignacian culture. That is what archaeologists call the earliest-known cave-painting people in Western Europe. Last year, Israeli researchers reported that the Aurignacians may have developed from an earlier culture, the Ahmarian, which was native to the Middle East and spread toward Europe around 45,000 years ago. But we cannot say whether mass migration, from the Middle East or elsewhere, created an artistic avant-garde in Borneo as well. That’s because the sites there are so remote that they have never been systematically excavated, Aubert says, adding that he hopes to start a proper dig in one of the caves next year. We can however be reasonably sure that the cave art in Borneo was done by Homo sapiens, rather than by other hominins, he says. For one thing, no other hominins have been demonstrated to produce figurative art. But mainly, a modern human skull dating to some 40,000 years ago was found in the 1950s in a cave in Sarawak, on the Malaysian side of the island, Aubert says. 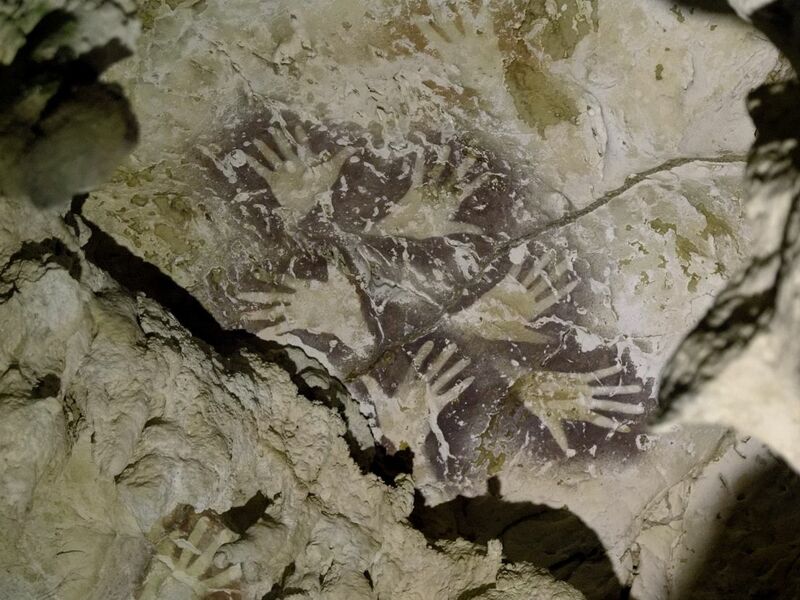 There was no art in that cave, but the find does confirm at least that our ancestors were in the neighborhood during the relevant period, the archaeologist says. 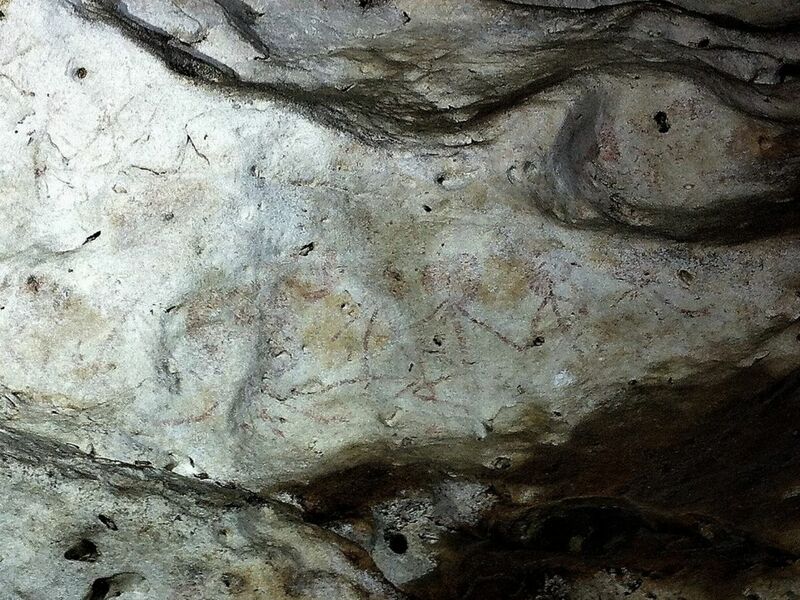 The archeologists also suspect that the prehistoric artists of Borneo did not shy away from exploring new lands. 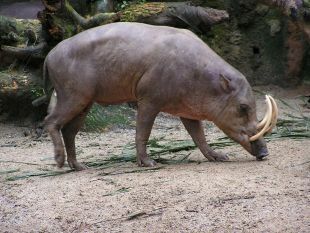 Already in 2014, Aubert and colleagues published a study which dated to around 35,000 years ago the image of a babirusa (also known as a pig-deer) found in a cave in Sulawesi, an island east of Borneo. “Our research suggests that rock art spread from Borneo into Sulawesi and other new worlds beyond Eurasia, perhaps arriving with the first people to colonize Australia,” Aubert says. Researchers also found that the spooky artistic entanglement of Europe and Southeast Asia was not a one-time occurrence. 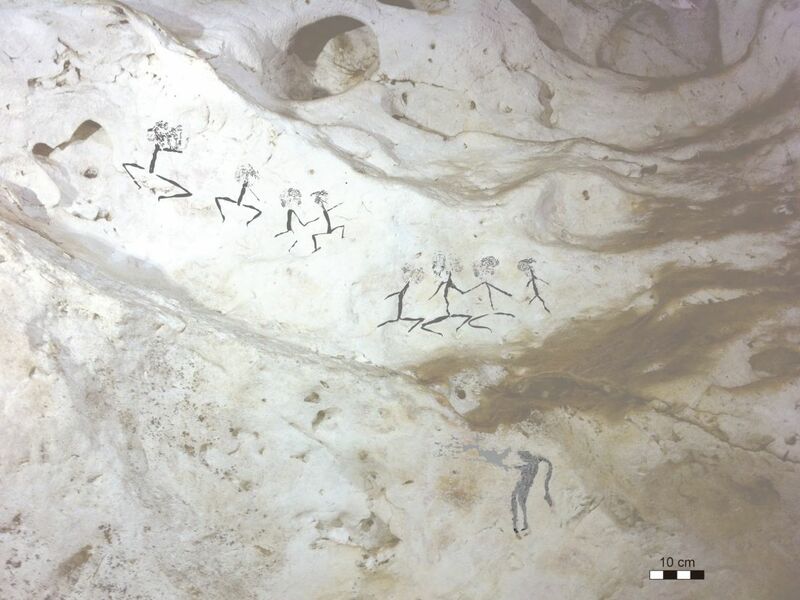 Aubert’s team identified a second wave of paintings in the caves of Borneo which began around 20,000 years ago, during the peak of the last Ice Age. In this phase, characterized by purple-colored drawings, the hand stencil motif continues, though now these images are often grouped together as if to form trees, perhaps suggesting family ties between the group’s members, Aubert says. More importantly, in this “purple period,” the images of animals give way to representations of humans: stick-figures wearing elaborate headdresses engaged in hunting, dancing or other activities. 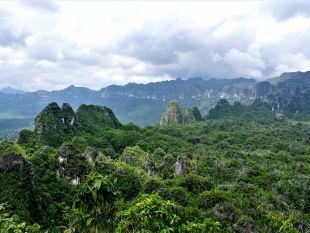 During the Ice Age, when sea levels were lower, Borneo was not an island as it is today. It was the southeastern tip of the Asian mainland. Technically, there could have been contact between the two sides of Eurasia, says Omry Barzilai, an archaeologist with the Israel Antiquities Authority and one of the researchers behind last year’s study on the origins of the Aurignacian culture. Further investigating the early inhabitants of Borneo, and especially checking if there was previous use of ochre or shells for decoration purposes on the island, could help confirm if figurative art was really something that developed independently in this region, Barzilai suggests. Questions about why and how our ancestors started making art go to the heart of a broader debate on when we developed symbolic thinking, the uniquely human ability to grasp and convey complex meaning using conventionally-agreed sounds or images. In other words, the question is: how did we become human, and when did it happen? Note that the archaeologists working in Borneo may well have identified the oldest figurative art, but some researchers believe humans became cognitively capable of producing abstract symbols much earlier. Going back half a million years, somebody – it seems Homo erectus – was engraving shells, which were found on the Indonesian island of Java. This is the earliest known decoration. Further indicating that Homo sapiens may have not have been the only hominin capable of making art, hand stencils and abstract shapes drawn in caves in Spain and Portugal between 66,000 to 64,000 years ago have been attributed to Neanderthals, although an alternative theory is that they were drawn by early sapiens inhabitants of Europe. In September, archaeologists claimed that the crisscrossing, hashtag-looking lines of red ochre traced some 73,000 years ago onto a stone in Blombos cave, South Africa, were the earliest example of symbolic art by Homo sapiens ever found. But there is fierce debate among researchers as to whether these lines, primitive hashtags and crosses represent actual art, and markers of symbolic thinking, or just random doodling. Early examples of purported symbolism tend to be few and far apart, notes Barzilai, the Israeli archaeologist.